After failing miserably with applying nail stickers in the past (I forget which brand it was now) I was hesitant to try them out again. Essie's "So Haute!" Sleek Stick Nail Stickers (RRP £11.99) came as part of the same Latest in Beauty Summer Nails Box as the Butter London nail polish from my last NOTD post. I didn't intend on using them, but over the weekend I thought I might as well give them a go rather than just leaving them to go to waste and I'm sooo glad I did! Let me just start by saying the packaging smells absolutely awful! You know that really strong horrible plastic-y smell? Yeah, that. Not cool! After I'd made sure that was firmly locked away in the dustbin and after washing my hands several times to get rid of the smell it came to deciding which sized stickers to use for each nail. Luckily there were sizes to fit all my nails except for the ring fingers where I just trimmed off the sides from a couple of the larger stickers that were left over. I can't get over how easy these were to apply after how difficult I've found it with other nail stickers before. You just need to peel the stickers off the packaging, line them up, stick them down with a firm push and then file off the excess sticker at the top of the nail with the nail file provided in the pack. Simple! 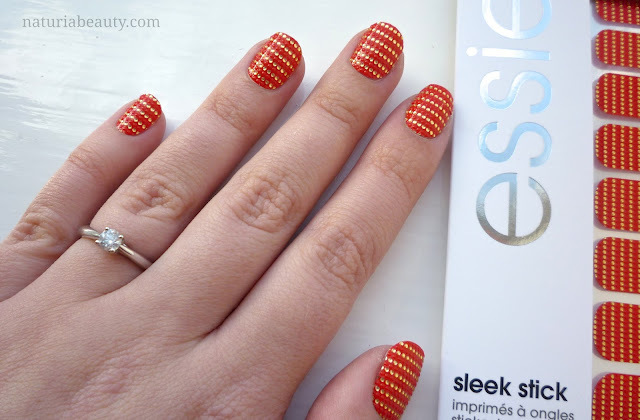 I really love the design and textured feel of these - Essie describe this design as a "gold spiked crimson". I'm not sure if you can quite tell in the photo below but the gold dots are raised up as well as textured clear dots in between the rows of gold. I've lost count of how many compliments I've got thanks to these! These have been on my nails for 2 days now and there are one or two stickers that are coming a tiny bit loose at the tips of the nail, but this is just damage from opening up the clasp on my Pandora bracelet! Apparently they can last up to 10 days so I'll add a little update here when they come off and if the glue on the back of the stickers has done any damage to my nails (hopefully not!). Have you tried nail stickers before? What do you think of these? So so pretty! My nails are a right old mess right now. Giving until the weekend before I paint them again! I'm a massive fan of Essie, but I haven't gotten around to trying these out yet, they have such a lovely selection! I've totally had fails with other stickers (like you)- I thought I was just doing them wrong!! I love the design of these. I cant believe how good they look, when ive used nail wraps/stickers before the edges have always gone funny and looked awful. These look so cool. Trust Essie to come out with the best nail wraps! Wow these looks amazing! I've tried nail foils before but can't remember what brand it was either haha. I couldn't believe how long they lasted on my nails though, they were amazing. How long did the essie ones stay on for in the end?